Before starting our journey with Drink Spirits, we had never heard of cachaça (pronounced kah-shah-sah) but our experience with it and Sagatiba have been so positive that we’re extremely happy to have discovered this easy drinking and flavorful spirit. As with cognac, cachaça is considered a region-specific product and cannot be produced outside of Brazil. Brazil produces a staggering amount of sugar cane each year. In 2006, Brazil produced over thirty million tons of sugar cane, almost more than India and China combined. With all this readily available sugar cane, Brazil has the luxury of using the fresh sugar cane juice which is fermented and distilled into cachaça. Cachaça is often mistakenly labeled as “rum” (and a quirky US law actually requires cachaça to be labeled “Brazilian Rum”). 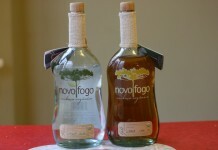 However, cachaça is its own unique spirit category with very strict parameters on how it can be distilled and sold. While most rum is produced from molasses, which is the byproduct of extracting sugar from sugarcane, cachaça can only be made from the fresh sugar can juice itself. While rum is extremely prevalent in the US, cachaça really isn’t. This can be partly attributed to the huge consumption of cachaça in Brazil, which consumes almost 99% of the cachaça it produces. The volumes are huge considering 1.3 billion litres were distilled in 2001 with an average of 13 liters consumed per person in Brazil per year. 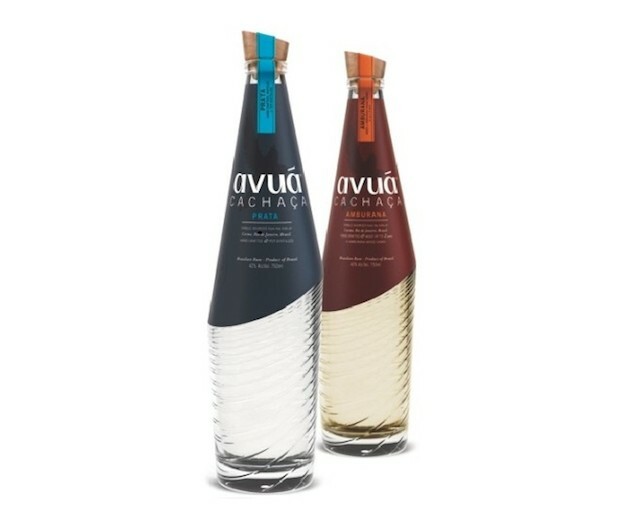 The consumption is so high that cachaça is ranked the 3rd top white spirit in the world. In the US, however, cachaça is just getting started. Aside from the quirky law requiring it to be mis-labeled as “Brazilian Rum”, many of the aged cachaças aren’t permitted to be sold in the US due to the woods they are aged in, including tropical hardwoods cut from precious rainforest (which most notable premium export brands use). 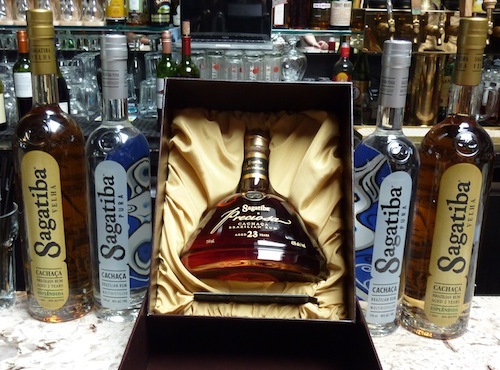 Sagatiba has recognized the opportunity for cachaça and created a premium line of export-friendly spirits. In the US, cachaça may be best known as the key ingredient in the delicious and easy to make Caipirinha which is a fantastic blend of lime, sugar and cachaça. Muddle the lime and sugar together in a glass, add the cachaça, ice, and stir. The drink can also be shaken and then served. One of the things we really like about Sagatiba’s cachaça is how well it works to smooth out and sweeten savory drinks. It can be used in some of our favorite tequila drinks in place of blanco tequila and in many vodka drinks. 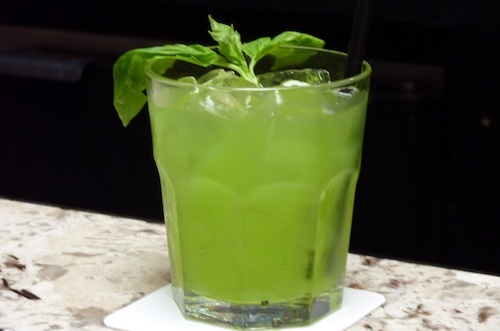 The Basil Smash – a basil and cachaça drink which is striking in appearance and taste. We never thought we’d fall in love with a basil drink, but with the cachaça it’s sublime. Fill a boston shaker 1/2 to 3/4 full of basil (you want to use a LOT), muddle it with the lime and sugar, add cachaça and shake with ice. Strain and serve over ice. Garnish with a sprig of basil. 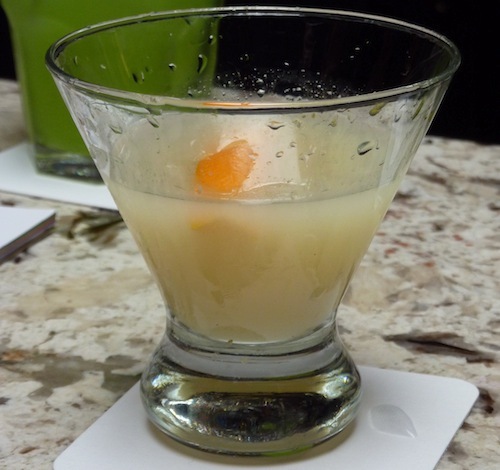 Rio Bravo – ginger can be volatile in a drink and quickly throw it out of balance or dominate a cocktail. In this drink the cachaça and orgeat do a fantastic job of balancing it out into an extremely delicious cocktail. Combine the ingredients and then shake, strain and serve up. Garnish with an orange peel. One of the things we enjoy the most about running Drink Spirits is the opportunity to discover and share new things. Cachaça is exactly the kind of spirit we started this site to cover. It’s one not too many people are familiar with and it’s exceptionally enjoyable. 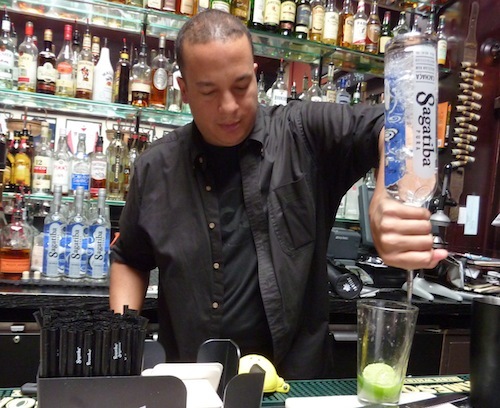 Enjoying spirits is a journey and cachaça is a great stop that we heartily recommend.